"A new page in rat history is about to be written!" For most fans, the only thing wrong with the Ah! My Goddess series is that there simply isn't enough of it. At only five episodes for the OVAs, it was just too short. With "short" being the operative word, a spinoff was created based on the manga Ah! Megami-Sama: Chicchai-Tte Koto Wa Benri Da Ne (Ah! 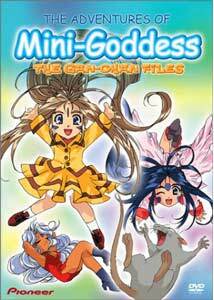 My Goddess: Being Small Is Convenient) by Kosuke Fujishima, which introduced us to a mini version of our favorite goddesses, and hence The Adventures of Mini-Goddess were born. With character designs by Hiroki Kazui, these are a collection of 48 mini episodes, running around per episode, and featuring super deformed goddesses in a series of misadventures, with their trusty companion, and brunt of most of their experiments, Gan-Chan the rat along for the ride. This first of four DVDs contains 12 installments, including the initial volume found on the Ah! My Goddess: The Movie DVD.For those new to the Ah! My Goddess universe, three goddesses from the Goddess Relief Helpline, Belldandy, Urd, and Skuld showed up at the home of a college student when he accidentally misdialed while ordering pizza. The goddesses' mission is to grant the wishes of their summoners, which can lead to unexpected results�they don't say to "be careful what you wish for" for nothing. Each goddess possesses magical powers, and each has their own specialties, related to their rank and position in the goddess hierarchy. Belldandy is a goddess of the present. She has a fairly even temper and her interests are in keeping people happy, and especially cooking. Urd is Belldandy's older half sister, and goddess of the past. She has a shortage of patience, and her somewhat demonic nature has her dabbling in all manner of potions and other strange concoctions. She also has a thing for sake and well ventilated attire. Skuld is the youngest of the bunch, being the goddess of the future. Her job at the Relief Office was the Yggdrasil computer system debugger, a task she performs with a hammer. She also has no patience, and is easily offended. Her specialty is gadgets, but when magic is called for, her skills aren't quite as finely honed as the need to be, so results are variable. Let's Tell A Fortune finds mini-Urd (Yumi Toma) auguring over Gan-Chan's (Mitsuo Iwata) future wife, based on his descriptions of who he is looking for in a mate. Needless to say, the results aren't quite what he is expecting. Some nice behind the scenes shots in this one. Secret Treasure in the Attic is a two-part adventure where mini-Urd and mini-Skuld (Aya Hisikawa) don mecha while hunting for promised booty in the attic. Gan-Chan also gets to pilot a machine, though his doesn't have quite the same "ring" as the girls. Another two-parter follows with Gan-Chan having his dream of flying realized through a number of mini-Skuld's recreations of historic aircraft in Let's Fly in the Sky, and the sequel Let's Fly into Space starts the rat race for the heavens. You might actually learn something here if you're not careful, as Mini-Belldandy makes a cameo. Skuld is giving Jenny Craig a run for her money in Slimming Down! Go! after Gan-Chan's visit to his cousins leaves him feeling bloated. Have no fear, our inventive mini-goddess has just the cure! Er...Next we see that leftovers can have a monstrous effect in this three-parter, as Gan-Chan munches on some moldy meals, and transforms into Gabira, the Giant Monster. Presented in Goddess Scope. Includes chapters The Birth, The Final Battle and The Strike Back. Oh no, they say he's got to go...Mini-Belldandy (Akema Okamura) makes a rare appearance in For Whom the Bell Tolls—The Mysterious Can of Food. Gan-chan's discovery of an unlabelled tin sparks a hunt for the substance's origins. Diamonds are a goddess' best friend, but you might think differently after seeing For Whom the Bell Tolls—The Secret of the Diamond. Mini-Urd is beside herself when Gan-Chan shows up with a rock. It must have been a cubic zirconia!Speaking of diamonds, Let's Play Baseball! The bases are loaded as Skuld and Urd face off in a championship baseball tournament. The Japanese voice acting brings the characters to life, and the dub is good, but doesn't have quite the same impact. There is plenty of hilarious action throughout, and the situations are high on the ridiculous scale, lending a lot of fun to the show. Since these are meant as comic offshoots from the series, we don't get the same type of relationship building the OVAs had, however we do get the interpersonal conflicts and insults that keep the chemistry intact. This is a great little batch of episodes. I'm just glad I'm not a cartoon rat. Image Transfer Review: Image quality is nice, with even, vibrant colors, and solid black levels. There is a small degree of interlacing, and minor aliasing in places. The presentation is very slightly on the soft side, grain isn't an issue, and no rainbowing was noticed. Audio Transfer Review: Both the original Japanese and the English dub tracks are clean with no signs of distortion or other technical deficiencies. Spectral representation is pleasing, with no excess sibilance or tonal imbalances. Stereo coverage is adequate, with appropriate soundstage utilization. The ending song is another winner. Extras Review: Somewhat limited in scope, on disc extras include a two screen character bio and 13 image art gallery for Belldandy. Menus are simple still frames, and each episode has three chapter stops. The end theme has alternating English and romaji subtitles available, or can be watched clean�watching Belldandy fly around here is lots of fun, even for the twelfth time. English credits make up the last chapter, but aren't accessable directly from the menus.Gan-Chan is the featured character on the packaging, with a brief intro on the package back, and a mini-poster on the insert's foldover, which bodes well for future installments. I had kind of hoped for a clear case with double sided art likes several other recent Pioneer releases, but this one is in standard black. If you enjoyed the personalities of the three goddesses from Ah! My Goddess (or more accurately in R1 the Oh My Goddess! OVAs), then these mini episodes should entertain highly. This collection is, of course, extremely cute, and my only disappointment would be the infrequency of Belldandy's appearance, which in these episodes is usually to ask the girls to clear their experiments from the sink so she can make dinner, or announce the evening's menu. There is no real relationship to the original series as far as plots go, with each episode being fairly self contained. Nevertheless, Mini-Urd and Mini-Skuld take turns subjecting poor Gan-Chan to various types of torture as they ply their trade. This is another must-have set for this anime fanboy.